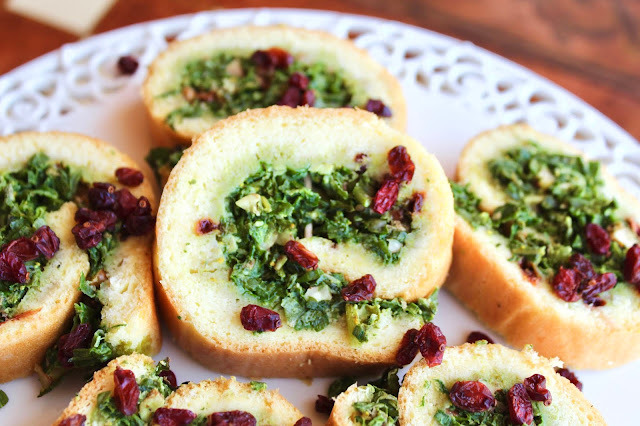 Spring is blessing us with delicious fruits, vegetables and herbs. Hope you enjoyed last week's exploration of natural herbal teas easily accessible in your own backyard! Currently on our little San Diego ranch, we can't keep up with our plentiful harvest; therefore, what we can't consume now, we either dehydrate to enjoy through out the year for delicious and natural snacks or turn them into jams or preserves. 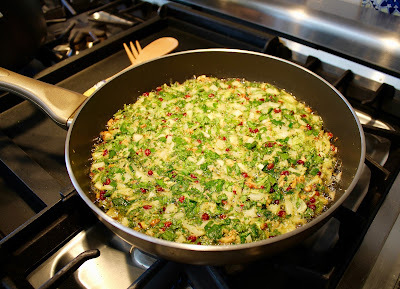 Many years ago, I wrote a series of posts highlighting my perspective on sharing recipes. Posts included Mehrak's Creme A La Vanille, Aunt Mary's Cardamom Cake, and Diane's Morning Glory Muffins. Some would say I was ranting; which in all truthfulness, I was! Since then, many of our readers expressed similar support for my tirade. After all, cooking is all about love: love of cooking, eating and of course sharing it with others. 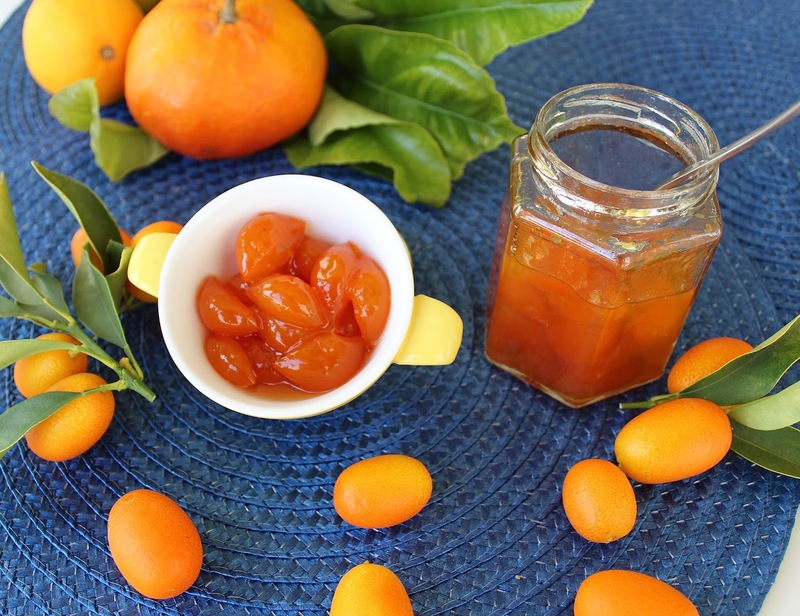 So with this post, I am sharing with you secrets a dear friend and neighbor shared with me for making Kumquat Marmalade. 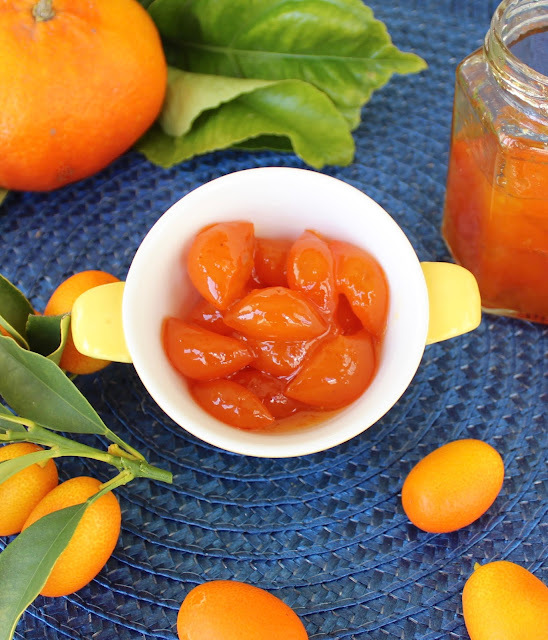 I can't believe it has taken me over a decade to post one of my favorite marmalade recipes which I frequently make from the plentiful kumquats on our ranch. Recently, our dear friend Mrs. Homa gifted us with a jar of her homemade marmalade. As you can see from the pictures, her marmalade sparkles with a bright orange burst of color. Without even asking her, she shared her secret with me! How sweet! So of course, I'm forwarding her gift to all of you! 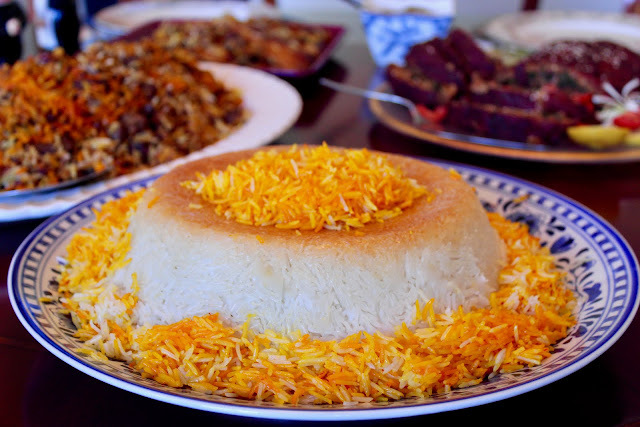 Her recipe showcases the exquisite essence of kumquat. This fruit has multitude of flavors: bitter, sweet, tart and tangy. Therefore, for this recipe neither liquor or spices were added (which would mask kumquat's natural robust flavors). However, a thread of saffron is added to exclusively enhance and maintain this fruit's natural beautiful orange color. Who said re-gifting is bad? In a large pan, bring to boil 5-6 cups of water. Add kumquats whole and boil for 15-20 minutes to extract the highly bitter rind. In your kitchen sink, drain out hot water and cool fruit. Cut in half kumquats and remove seeds. 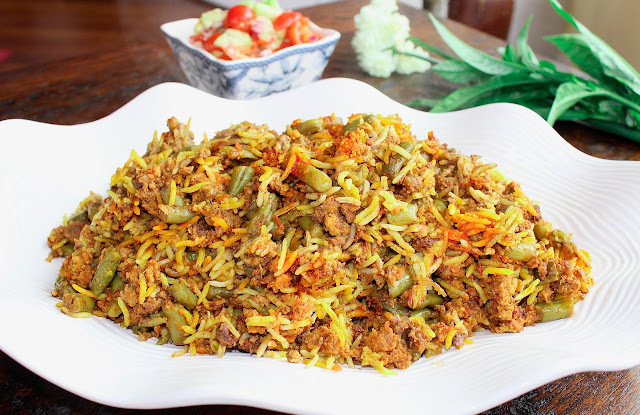 In a medium size copper or regular sauce pan over medium low heat, gently boil saffron, sugar and water. Stir until sugar has dissolved and a gentle boiling syrup is rendered (10 minutes). Add kumquats and gently boil for 30-45 minutes until fruit is soft but not falling apart. Cool and preserve in decorative glass jars.